The company passes the test of this road-tested vehicle. 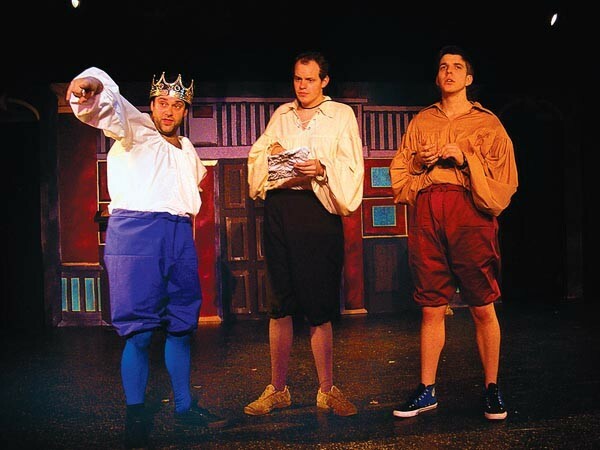 From left: Andy Kirtland, Connor McCanlus and Nicholas Browne in The Complete Works of William Shakespeare (Abridged) at Unseam'd Shakespeare. 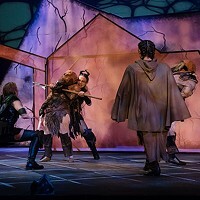 The Unseam'd Shakespeare Co. celebrates its 20th anniversary of distinctive deconstructions of the Bard with something it usually doesn't do: a pretty straightforward rendition of somebody else's Avonian interpretation. The Complete Works of William Shakespeare (Abridged) has been in pretty much eternal production since first unleashed in 1987 by Adam Long, Daniel Singer and Jess Winfield for the Reduced Shakespeare Co. (no relation). 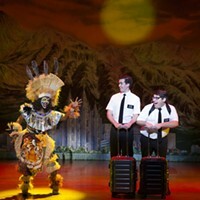 The shtick is that three actors perform, or at least represent, all of Shakespeare's works in 97 minutes, with dozens of rapid (if unrealistic) costume changes, unseemly asides and occasional improvisations for highbrow low-concept comedy. The RSC has milked, er, worked this condensed concept into history, sports and other themes to create an army of "The Complete [fill in the blanks] (Abridged)" companies constantly touring throughout the Anglophonic world. Ha. OK, for us older theater-goers, the joke has sometimes, somewhat worn thin, the misogynistic and homophobic "humor" brittle. 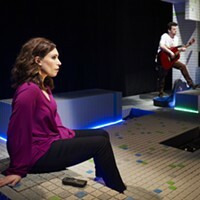 But regularly revised and improvised to reflect current pop culture and local references, Complete Shakespeare is a good vehicle to test the mettle of cast and crew. So cheer on the winning local team, directed by Elizabeth Ruelas, as they rip Romeo, rap Othello, mangle Macbeth, tenderize Titus and haul Hamlet through increasingly frenetic iterations. Andy Kirtland, Unseam'd's new artistic associate and producer, multi-tasks even further as fight choreographer as well as actor, including a cast-against-type line-up of hirsute Shakespearean heroines. Nicholas J. Browne plays the wide-eyed, slim-legged youth who usually gets dragged into the drag roles, and Connor McCanlus is in suitable pompous mode as a series of buffoons. Deserved applause also goes to stage manager Charlene Jacka and to designers Jennifer Gilbert, costumes; Danielle DePalma, lighting; Elizabeth Ruelas, sound; and Santina Moran-Seaborne, scenery (also the heroic properties master). A good time is had by all. The Unseam'd Shakespeare Co. takes a short busman's holiday with The Complete Works of William Shakespeare (Abridged).